Everybody does some meat cooking. Who doesn’t cook? We cook with love. Sometimes meat cooking is not easy. Especially, cooking meat can be challenging. A bad smell wraps the house after cooking. Even if the dish has no scent, it can stick to skillet and grill. Especially meat foods can make a problem for us. So what we should do? Answers are so easy, you just need to read our article. You will find some Meat Cooking tips in this article, and I will briefly explain what we should pay attention to meat cooking. 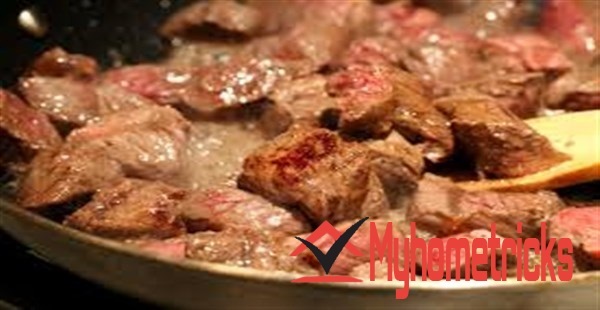 At first, for cooking meat quickly, make the meat rest in vegetable oil for a while, so the meat gets softer. While cooking, add a half lemon on the saucepan. Thereby, not only you will cook the meat quickly, but also increase its flavor. You can add some bread inside and vinegar into the pan, and with any vegetable oil you can increase the speed of your cooking. You will entertain guests, and you have a short time, so I advise to saute your meat. The meat which sauteed will be softer and cook more quickly. If you want to get rid of some kind of chicken and meat cooking smell, you need to add peeled onion to the saucepan while cooking. Onion absorbs to bad heavy smell immediately. If you don’t want your meat and chicken to get dry while cooking in the oven, you can put a cup of water in your oven with your meal. Don’t forget that if they don’t be kept as required, meats are go bad quickly. And if you eat this meat, you can be seriously sick. So we need to refresh our knowledge of the meats. Meat should be stored in the freezer of the refrigerator. You should keep your refrigerator cold as much as possible if your refrigerator doesn’t have a freezer. Red meats are a resource of vitamin and protein. Besides this, they are a deposit of iron and zinc. The color of vacuum packed meat shouldn’t be burgundy or purplish if the meat is fresh. The meat should look bright red when the meat has bought from the butcher. Because when touched to air myoglobin cells receive oxygen. And this makes them bright red. If your meat stayed over 5 days in the refrigerator and became brown colored and feels sticky, that means your meat is spoiled. Don’t eat that meat ever. Tip: If you would like to know more about “Meat Cooking“, click on the word “tags” below. Cooking Safety Tips You Need to Know How To Cook For Extra Guests? Cooking Tips For Fruits? How Can I Cook Duck? How Can I Prepare For Cooking? How Can I Bake Properly? How Can I Became A Great Chef? How Can I Cook Soups, Stocks, And Sauces?